Take Interstate 95 and/or 495 (Capital Beltway) to Interstate 95 North for approximately six miles to Maryland Route 198 (Exit 33B-Burtonsville). Travel west on Route 198 for about ½ mile to the first traffic light and turn left onto Sweitzer Lane. Continue on Sweitzer Lane (past the Patuxent Water Filtration Plant) toward the end of the street. On the left will be the WSSC Headquarters (a large blue glass building) at 14501 Sweitzer Lane. Take U.S. Route 1 (Baltimore Avenue) north through College Park and Beltsville to Maryland Route 198 in Laurel. Turn left onto 198 and continue to the traffic light at Sweitzer Lane. Turn left onto Sweitzer Lane (passing the Patuxent Water Filtration Plant) and proceed toward the end of the street to the WSSC Headquarters (a large blue glass building on the left) at 14501 Sweitzer Lane. Take Exit 33B toward Burtonsville. Merge onto SANDY SPRING RD/MD-198. Prepare to turn left onto SWEITZER LANE in 0.8 miles. Three lanes turn left, but one lane disappears after the turn, so it’s easiest to stay in left lane. Drive 0.7 miles. WSSC is the tall blue-glass building on your left. You may park in the visitor lot across the street to your right, or in two lots in front of the building. If parking on the building side, pass the one-way circular driveway exit, then turn left into the lot from the next entrance. Pass the exit from the circular driveway, then turn left. Make immediate right into first visitor parking area. If lot is full, turn right to proceed to the second visitor parking area. You may also park in the lots across the street. Do not use spots marked for WSSC trucks, at the north end. Use caution at crosswalk on Sweitzer Lane. After entering the building, stop at the security desk straight ahead. Follow signs for KONTERRA DRIVE 198 exit, which is BEFORE you see WSSC’s building. Stay to the left WEST spur. Turn LEFT onto KONTERRA DRIVE. Cross over highway on KONTERRA (what used to be Van Dusen) and immediately turn right at the first intersection, SWEITZER LANE. Note there is a right-hand turn cutout. WSSC is the second tall office building on right, covered in blue glass. Immediately turn right into first visitor parking area. If lot is full, turn right to proceed to the second visitor parking area, with entrance near the end of the circular drive. You may also park in most of the lot across the street. Do not use spots marked for WSSC trucks, at the north end. Use caution at crosswalk on Sweitzer Lane. 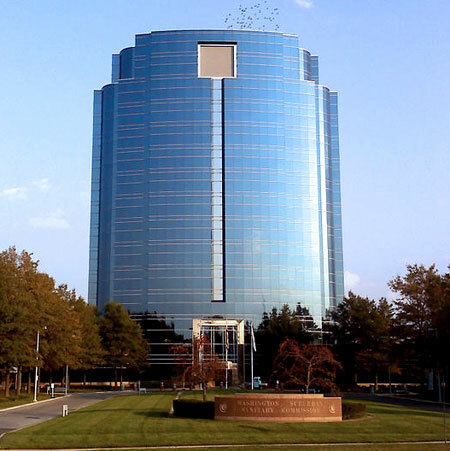 WMATA bus can get you to WSSC’s offices at 14501 Sweitzer Lane, Laurel MD 20707. The stop is right in front of the Headquarters Building. View the Z9/ Z29 time schedule. Parking is available in the "Visitor's Parking" lot in the front of the building. Please sign in at the guard desk and ask for directions to the appropriate office. When the visitor's lot is full, visitors may use the parking lot across from WSSC headquarters on the other side of Sweitzer Lane.